Kenseth earned the pole in the unique qualifying format that consists of three laps and a four-tire pit stop with no speed limit on pit road. Kenseth’s teammate Ricky Stenhouse Jr. took the second starting position. Both teams strayed from the norm on their pit stops, changing the left-side tires first. That put both of them in the 16-second range. Kenseth’s third pole in his 18th All-Star race tied him with Kyle Busch and Rusty Wallace for second on the all-time list for most poles in the event. Bill Elliott leads with four. Stenhouse hit a drain as he exited pit road, but still managed to grab the No. 1 position before Kenseth made his run. “(Spotter) Scott Bowen did a good job with our pit crew, both Matt (Kenseth) and mine,” Stenhouse said. “We were able to have fast pit stops with no penalties and that is mainly the biggest key for this qualifying format. Kenseth said he was still in “catch-up mode” when it came to assessing Roush Fenway’s cars. However, Stenhouse said Kenseth’s contribution had been what he expected. 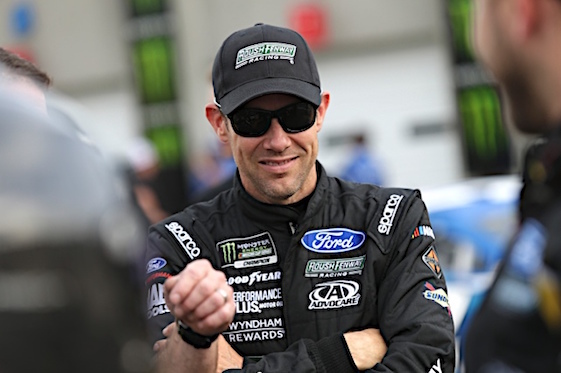 “He (Kenseth) is pretty direct with how he feels about the race cars and it is nice that his directness is exactly like mine,” Stenhouse said. “Hopefully, we can get some movement in the right direction with our cars. I think for me it is reassuring that he feels the exact same way that I do. Ford not only swept the front row for the All-Star race, the manufacturer commandeered the first four starting positions. Clint Bowyer claimed third and Kevin Harvick qualified fourth. Martin Truex Jr. was the highest qualifying Toyota, rounding out the top five. Austin Dillon possessed the top Chevrolet, securing the ninth starting position. Seventeen cars qualified on Friday for Saturday’s All-Star race. The winner of each segment in the Open as well as the overall victor will advance to the All-Star race. The final driver in the All-Star field will be determined by the fans.